Remain collected and elegant at all times. Such is the family motto of the Tōsaka's. 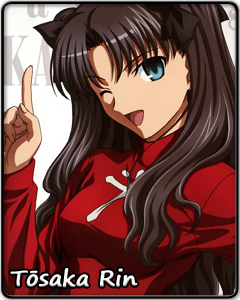 Successor to the family magecraft and inheritor of its legacy, Tōsaka Rin was brought up ready to follow that creed. She would obey her father's teachings to the letter and make him proud, whatever hardships might await her on the way. Rin realizes that the life of a magus is a life of sacrifice. She was taught to prioritize sorcery over personal interests. She is bound to keep up appearances before her friends, both to keep her magic a secret and to maintain the good name of her family. She knows that the path she walks down requires time and effort. What she is not prepared for, though, is the danger that will eternally follow her and everyone she loves. Rin takes every burden upon her shoulders without question. She does not care how difficult things are for her. The one thing she fears is powerlessness. As fate mocks the young magician with ever more painful farewells, Rin curses her own inability to change the world around her. She needs to become more than she is. She needs superior spells, perfect tactics, and the courage to plunge herself into war without a moment's hesitation. As a Tōsaka mage, she may one day put her life on the line to fulfill her family's ambition. She knows she will be ready. She does not allow herself to consider the thought that everything could go horribly wrong. Rin is caring and delicate under her tough exterior, but as a magus, she chooses to kill all fear and hesitation within herself, no matter how much pain it will bring upon her.